Before started any CNC machining project, it is critical to be meticulous in planning as this can save you money and a lot of time in the long run. 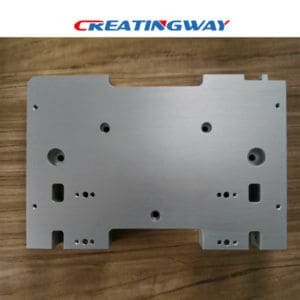 People who are new to CNC machining process, tend to assume that the automation involved will automatically result in cheap, fast and easy to produce parts. The reality is that the cost of simply owning and operating a CNC machine can be shocking. In fact, making a single part could cost you hundreds of dollars. Production costs can be mitigated through several ways by first identifying the factors in part design that may drive CNC costs more than others. These factors should be identified early in the production cycle in order to minimize their use. This does not mean compromising on quality by using cheap substandard material. Simply choose the most available and cheapest material that can still meet your design requirements with the same intended results. In case your project involves functional prototyping, try as much as possible to make use of cheaper options such as aluminium and ABS. Pricier materials such as stainless steel can only be used when designing implantable medical devices where bio-compatibility is essential. Your part may occasionally have some features that could require special non-standard fixturing and this could further aggravate costs. Parts with complex and organic geometry should be avoided as they may not always be held well in the standard vice which means the part surface has to be machined through a complex and time consuming process for a better grip. Parts that contain abnormal features or features that are not parallel to stock surfaces should also be avoided as much as possible. It is important to consider how your part will be made besides what it will be made from. The amount of setup time before the machining process begins is largely determined by design. Non-recurring engineering costs (NRE) typically make up the largest portion of machining costs during prototyping hence they should be minimized where possible. These costs are aggravated by setup time which involves computer-aided manufacturing (CAM), as well as part fixturing and machine setup. The number of setups should be reduced as mush as possible as each setup will require its own fixturing step and CAM program. NRE costs are non-recurring as their name suggests which means that if you are making multiple same parts, the same fixturing and CAM programming may be used over and over again. One stock piece can be cut to produce multiple parts at once and more than one of all the parts can be made which will lower your unit cost significantly. Make enough parts so that you do not have unneeded ones. Another important cost saving aspect to consider is the actual part machining time. This will be determined by two factors namely material and part design. It is important to choose the most machinable material if functional requirements allow as this saves money. Hard materials take a longer time to machine since there is the risk of tools breaking although there are a few exceptions to this rule one must consider. Aluminium which is harder than most plastics is easier to machine compared to cutting plastics although the cost of aluminium is higher. Cutting plastics fast leaves a bad surface finish. Steels that contain a high carbon content alloy are more difficult to machine hence its advisable to go for low carbon alloys such as 303 stainless steel which is relatively fast to machine. Metals such as brass that contain zinc or magnesium are also easy to machine. Part design also has an impact on cost since most functional requirements will consider part design. Tighter tolerances will definitely translate into higher costs thus for purposes of prototyping, reasonable standards should be maintained. Small and deep holes can take longer to machine besides being prone to breakage of tools. Avoid this as much as possible. The internal radii should be big enough, a small radius means that a smaller end mill will be required which will slow down the machining process. These cost-saving tips should help you in your next CNC machining project especially for those who are new to product development and design. They should be considered early on in the CNC project design to maximize their value.